CFD Trading – Contracts for Difference – is becoming increasingly popular in recent years. It’s simple and you don’t need a large sum of money in advance. I think it’s approachable by anyone – the only barrier to entry is the jargon. So I’d like to use simple words to explain what CFD is briefly, and show you the demo of one of the famous and reliable CFD service providers in the UK, “Plus 500 UK Ltd” ***. Please note however, while CFD is available in many countries across the globe, not permitted in others including the USA for regulatory reasons. It is permitted in Canada, but unfortunately the product I’m going to introduce later on (Plus500) is not available in Canada either. Plus500 has been in touch with me and kindly advised me of the updates. Please note of the following disclosure. Plus500 UK Ltd is authorised and regulated by the Financial Conduct Authority (FRN 509909). 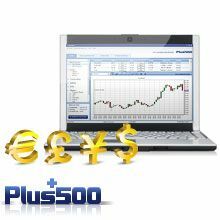 Plus500 CY LTD is authorised and regulated by the Cyprus Securities and Exchange Commission (License No. 250/14). Plus500AU Pty Ltd, AFSL #417727 issued by the Australian Securities and Investments Commission is authorized to issue these products to Australian residents. You do not own or have any right to the underlying assets. Prices in the world change every second – company share prices, foreign exchange rates… Commodities (oil, gold, coffee & sugar), world indices. You enter into a contract at the quoted price, where you speculate whether the price will go up or down in the future. And when the position is closed, the difference between the contract price and the closing price is settled in cash. It works like this: instead of purchasing 1,000 Microsoft shares from a stockbroker, you buy a 1,000 CFDs on the platform. If the share price rises by $5, you’ll make a $5,000 and if it falls by $5, you’ll lose $5,000. But you don’t pay that much of money (unless you want to) – you set a criteria how much you could afford to lose, and pay enough money as a deposit. …to rephrase it, unlike an investment, you either receive your profit or suffer the loss without owning the asset. With Shares and Commodities, you can also start by “selling” at the opening position. If you think the oil price will fall, you want to “sell it” now. The price falls and you “buy it back”. Of course what you receive is just the profit – difference between the opening price and the closing price. If the price rises against your wish, you’ll have to pay the difference. Leverage of “10%” (or 1:10) means that if the price of the asset changes by 1%, the price of the CFD will change by 10%. So CFD offers an accelerated return. Small price changes in the asset will be magnified, so it multiply gains, but it can also multiply losses. Remember, it can result in the loss of your entire capital, so you need to understand the risk before start trading for the first time. Instant access and easy to use. You can trad on web, or download the module onto Windows PC or download app for iPhone, iPad, iWatch, Android or Windows phone. Support is reliable (by either chat or email form). I’ve sent an email with queries in the evening, and received a reply within 20 minutes. Instant access to a demo account is very useful. No time limit, no need to use real money therefore no risk, also the demo is in real market conditions. You can receive online help and support while trying the demo. Now I’ll explain which instruments Plus500 covers. You would receive dividends – Plus500 (as the CFD holder) will pay you the dividends instead. (UK) you would have to pay stamp duty tax upon purchase of the shares, but with CFD you don’t have to pay any. Plus500 comes with professional graphs, profit/loss limits and variety of currency pairs. Trade on the FX market with up to 1:294 leverage. Allows you to start trading from GBP £200 to gain the effect of £40,000 capital. Up to 1:294 leverage and low margin demands. Continuous real-time updating of grass provides long term analysis of rate changes. Trade in oil, gold and silver with up to 1:152 leverage. Start trading from GBP £100. ETF market with up to 1:100 leverage. Allows you to start trading from GBP £200 to gain the effect of £20,000 capital. Professional graphs, profit/loss limits. Option CFD’s on the most popular indices in the world. Wider range of hedging possibilities with Call or Put options CFD – deal on rising, falling and sideways markets. Free real-time rates on options CFD. Long term analysis of price changes. Live Rates: Here are the rates as of now in UK, Australia and Germany – click each tab (Shares, Commodities, Indices, Forex and Options) to view the rates. I hope you’re interested in this great programme – click the banner below to try the demo module for free!